January is the perfect time of the year to reflect on the year that has passed, and plan for the year ahead. Many of us mark the coming of the new year with resolutions to improve our lives and well being. While this can be a daunting task, invasive weeds may actually offer a great way to help you keep on track this year with your resolutions. One of the most common New Year’s resolution is to get fit. Whether this amounts to losing a few pounds or increasing your strength, invasive weeds offer a great opportunity for getting into shape! Pulling garden weeds can burn as many as 400 calories per hour, raking and bagging pulled weed can burn up to 450 calories per hour. More strenuous activities like removing English ivy or Scotch broom can burn even more calories, and help build core strength. Not only are you likely to get healthier by pulling weeds, but you are also increasing the ecological health of your surroundings. There is no need to buy expensive equipment or that gym membership: just find a weedy patch in your area and pull your way to fitness! Volunteerism is a great way that we can give back to our communities and to organizations that we cherish. Invasive weeds offer a great opportunity to contribute to your community. There are a multitude of watershed councils, friends groups, and nonprofits that work in natural areas removing weeds and increasing the livability of our communities. Statewide, groups like SOLVE offer regular events to pull weeds, pick up trash, or plant native plants in your area. These event offer a great opportunity to give back to your community and you have a great chance to make new friends in the process. In our hectic and modern world, we find ourselves spending an ever increasing amount of time in front of a computer. While computers offer us a plethora of information and entertainment (for example, what are you doing right now? ), they can also distract us from the other things important in our life. Reducing our “screen time” can increase our overall health as well. 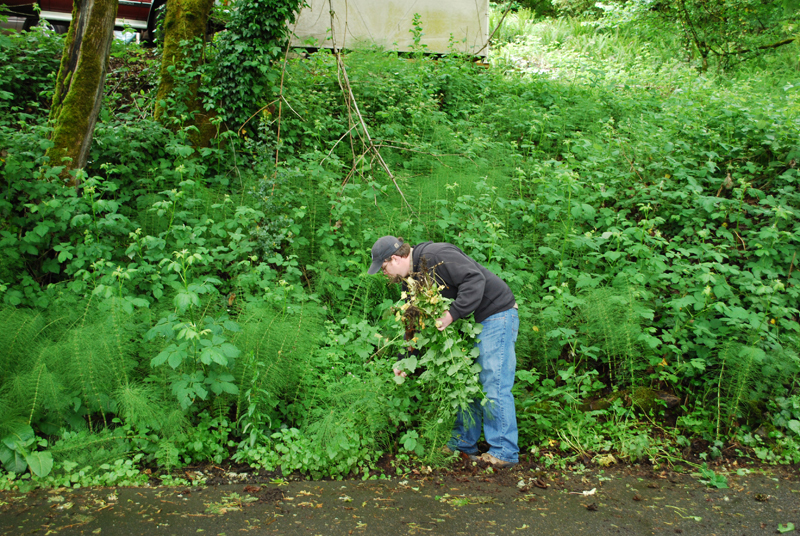 Pulling invasive weed can offer a healthy escape from the screen. Pulling invasive weeds gets us outdoors and breathing fresh air. So why not choose your favorite natural area to spend some time pulling some weeds, where you can breathe some fresh air and regain perspective. If anything it will make for some excellent photos to upload to your Facebook profile. Weeds offer a great way to release stress. If you are feeling frustrated, there is nothing more gratifying than ripping weeds from the ground. Beating up on these biological bullies can be a cathartic experience. Feeling really stressed? Then check out one of our Weed Wrenches or Extractigators from our weed equipment library and go after some big weeds like old growth Scotch broom. As the year progresses, even the most dedicated person may be tempted to backslide on their resolutions. But weeds stick with us the year round, so let them serve as a reminder of your commitments to yourself. So each time you gaze upon the ivy climbing the trees on your drive into work, or the tansy ragwort starting to bloom in the pasture remember that the good fight, can also be good for you. So what is up with Weeds in January? Common reed grass (Phragmites australis) is a grassy perennial. Plants that were emerging in April, May, and June have seeded, dig up any plants and dispose in trash. Interested in Helping Craft Our Budget?